Mint is one of my favorite things to forage because I love everything mint! Honestly it’s more like an addiction. When I’m stressed I crave mint. Thin mints, mint chip ice cream, peppermint tea, Junior Mints, or these awesome mint bars my mom makes with Creme de Menthe. Apparently I have my grandmother to thank for this because she discovered at a very young age that I would calm down for anything (like a first haircut) if she fed me Junior Mints. Like when Scooby Doo is scared and they feed him Scooby Snacks and suddenly he’s the bravest dog in the world. Yeah that’s me with Junior mints. Well I also love free food so to satisfy my insatiable appetite for all things good and minty I forage. There are several species of mint and there isn’t an exact count on how many as mint hybridizes a lot. Many of the common culinary varieties are native to Europe and Asia but there is a mint that’s native to North America, often called American Wild Mint (Mentha canadensis), that is just as good. In your search for mint you may run across non-native varieties as they naturalize and spread like wild fire and some are considered invasive. Mint’s roots, called rhizomes, spread underground and send up shoots all around the original plant. 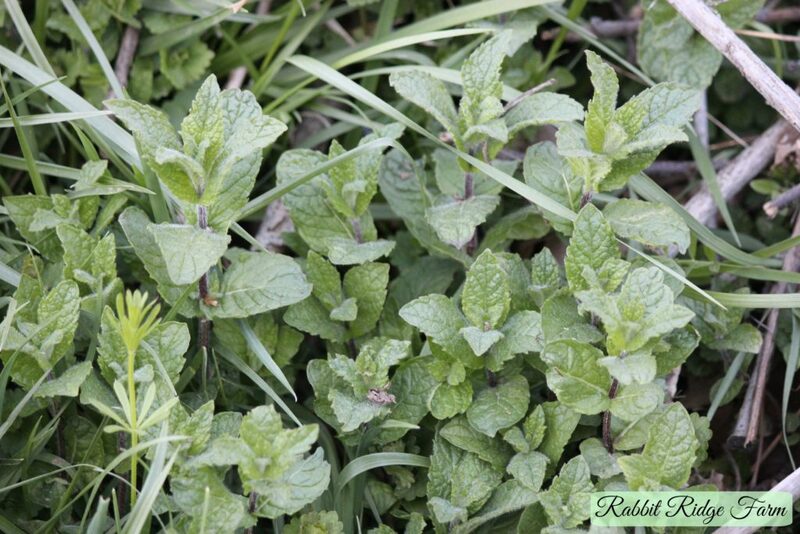 Mint thrives in moist areas so start your search in low open areas. American Wild Mint may be found near lakes, wetlands, rivers, or simply in low fields. You may also find cultivated varieties of mint growing wild. A great spot to look for these types of mint is around old homesites. The mint I found is in a field on our property and this area used to be full of coal miner’s homes. There was a barn that used to sit next to where I found it so it was probably some a miner’s wife planted that naturalized. As there’s a wide variety of mints that you may come across the easiest way to tell that you have mint is its strong minty aroma. I’ve even found mint growing simply by being around when a field was being mowed which filled the air with the scent of mint as it was cut. You can also identify members of the mint family by their square stem and opposite leaves. Many varieties have slightly fuzzy leaves (like the type I gathered). Their flowers range from white to purple. 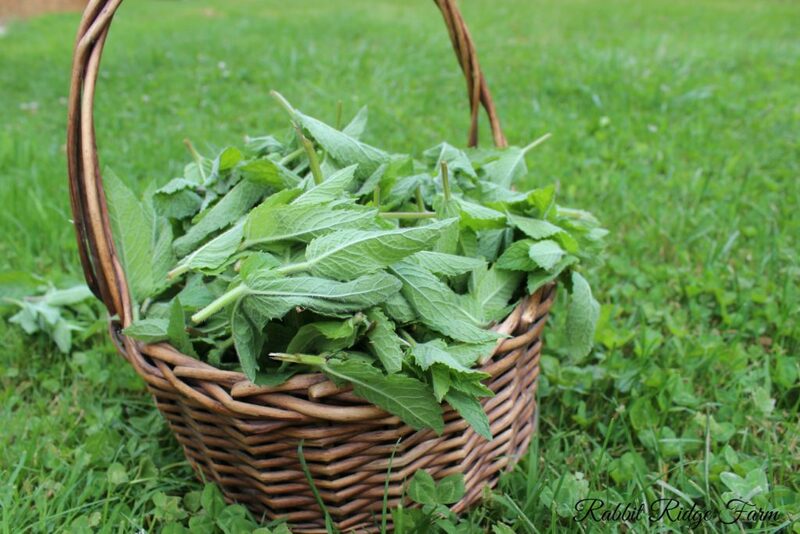 If you don’t want to forage for mint or even if you do and just want some closer to your home mint is one of the easiest herbs to grow and is one many perennials you can get for free! It’s a hardy and spreads so fast you only really need to start with one small plant. The way I’ve always gotten mint in the past is simply by digging some that I’ve found but it’s also available in most garden stores or you can order seeds. To move mint all you need to do is dig a small section of plants. I’ve dug small sections with probably a 3 inch diameter and 4 inch depth and had them do excellent. Then you can plant it where you want. It can tolerate some shade or full sun but just like when it grows wild it really thrives in fairly moist areas. If you don’t have a place like that just remember to water it. Plant it at the same depth it was when you dug it and water it in well. Unless you want huge swaths be prepared to contain it some how. You can plant it in a raised bed or cut the bottom off a large pot and bury it to grow the mint within. Mint can also be grown in containers if you’re an apartment homesteader! Mint can be harvested at any point during the summer. You can clip the sprigs off about an inch above the ground. 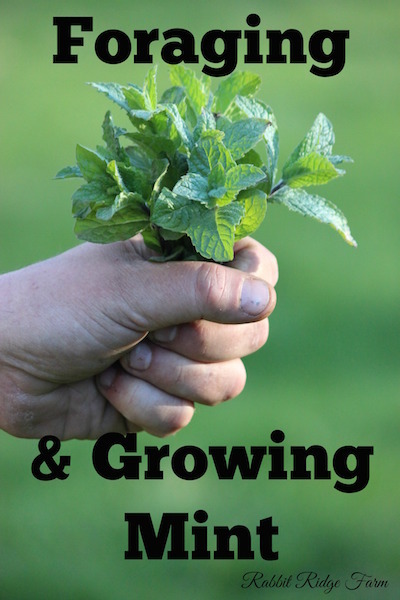 It is really hardy but especially if your mint is just getting established you don’t want to harvest all the sprigs and even with well established plants if you’re harvesting all the sprigs don’t do it more than 2-3 times each summer. I’ve always had such big mint patches this has never been an issue and I usually just harvest a few handfuls as needed and then a bit for winter. My method of storing mint may not be the best way but it’s perfect for off grid living. I tie a bundle of sprigs together at the base then hang them from a nail on the wall in my kitchen so they get plenty of air flow around them. When they’re completely dry I strip the leaves off and store them in a mason jar. If you’re not worried about your electric usage I’ve heard that the best way to enjoy as close to fresh mint as possible all winter is to freeze chopped mint leaves in water in an ice cube tray. Now that you’ve got your mint there’s a whole delicious world that’s open to you. The easiest way to use your fresh mint is probably tea (you can use dried mint too). It’s tasty and I often use it when I have an upset stomach. Mint is great for soothing stomach ailments. To make mint tea is easy all you do is pour about 2 cups of boiling water over a handful of mint leaves (or more if you like things really minty). I usually add a touch of sugar or honey to mine as well. You could also replace the hot water with hot cocoa to have mint cocoa (I had a college friend who absolutely loved this). Thanks for stopping by and lemme know if you have a mint recipe that should be on this list. I’d love to try it! I am not an expert. Be sure to positively identify any wild foraged food before consumption. 4 Responses to "Foraging & Growing Mint"
Our office at work was 89 degrees yesterday (it's an old building, no working AC in our office). I enjoyed mint leaves in my water to help cool me. Have you seen all the varieties of mint available at nurseries…apple mint, chocolate mint…they really are fun. Of course we have a wild mint that was transplanted, like you do. Love it! Thanks for hosting the blog hop. Your love for mint sounds similar to my own! I just can't get enough of it! It is definitely my favorite herb in my herb garden! That does not sound fun at all, love the mint in the water idea the though. For yet another mint related idea I love showering with Dr. Bronner's peppermint soap after hot days. I've only tried the chocolate mint variety but I would love to try more! Thanks for reading and you're absolutely welcome.